Your goal is to move all cards to the 4 foundations, building up by suit and starting with the cards of the same rank as the first card dealt to the leftmost tableau pile (the "beak"). 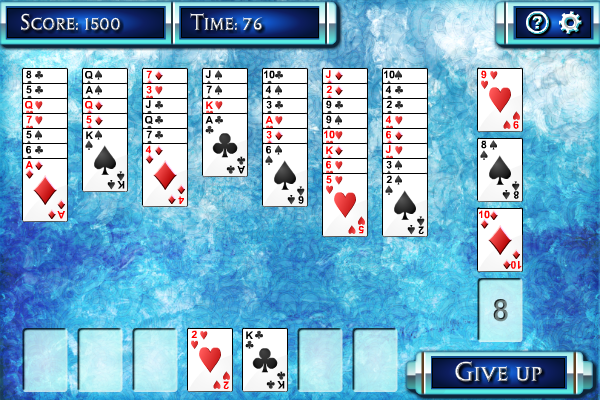 When the game starts, each of the 7 tableau piles at the top of the screen will be dealt 7 face-up cards. The first card dealt to the leftmost tableau pile will become the beak, and the other three cards of the same rank will be dealt to the vertically arranged foundations at the right, leaving one foundation empty. For example, if the beak is a 6 of spades, all other 6s will be dealt to the foundations. For the empty foundation, you will need to move the beak to it. 7 empty reserve cells are located at the bottom of the screen. The foundations are to be built up by suit starting with the beak, and wrapping from K to A if necessary. Cards in the tableau piles are to be built down by suit, wrapping from A to K if necessary. Each time you can move a card or a group of cards built down by suit to another tableau pile. Each empty reserve cell can hold 1 card, and cards in the reserve cells can be moved to a tableau pile or a foundation. When a tableau pile becomes empty, only a card of the rank immediately below the beak or a group of cards starting with that rank can moved to the empty tableau pile, for example, if the beak is a 6, only a 5 or a group start with a 5 can be moved the empty tableau pile.